Key findings from PhoCusWright, presented by Tnooz, reveal the strength of Europe’s holiday rental segment. Despite the complexities of the European holiday rental market, the potential for revenue there is undeniable, PCW estimates the current in the report titled: PhoCusWright’s European Vacation Rental Marketplace: 2011-2013. 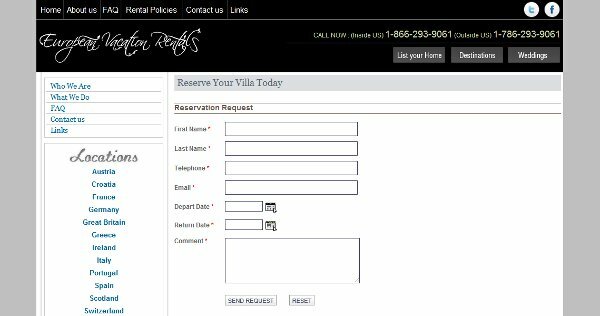 Form fill, on an otherwise decent vacation rental site, leads with no traffic? Hmm. Vacation rentals, at least for the American student of family holidays, is no new concept for Summer holidays. I can remember since way back when our family opting for the beach house week versus the Holiday Inn at twice the price and half the utility. What the reader may not know though, is that in Europe holiday rentals are far more common than in the states even. The Tnooz article by Linda Fox, referred to, sheds light on this aspect. And too, key aspects where online booking of vacation rentals go. The end of this tale leads to three tangibles. First, the millions of home or property owners across the European property landscape (suppliers). Secondly, the tens of millions of travelers to Europe looking for the best experience. Now, interject upon this vibrant dynamic the fact that no one has so far even dented the online booking potential of this market. Even thinking about new customers to the continent, customers who might not even be aware there is something better for their vacation plans out there. The top image is of a form fill tied to a not so horrible website with a really nice domain name; http://www.europeanvacationrental.com. What a waste of money that was, Alexa 2.9 million basically means no one has ever seen this site. As the rental market in Europe matures over the coming month’s and years, it’s clear players online who engage and provide the needed booking excellence suggested, will have a profit potential of proportions. And as the Tnooz article pointed out, user reviews and sites like TripAdvisor, which at one time created a trend, may give way to new innovation and ideas. 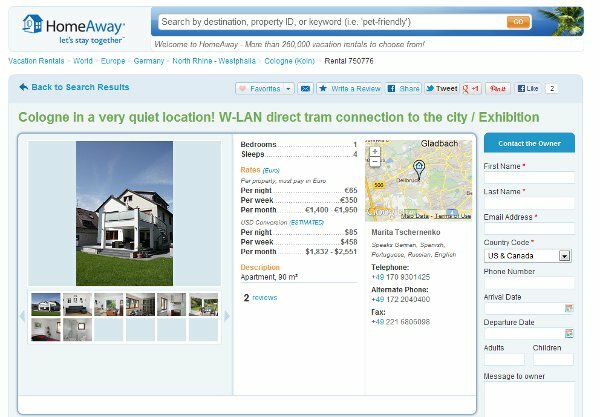 HomeAway to EuropeHomeRentals.com, it is interesting to note that no one has really seemed to have grasped yet, the potential of building and then marketing a refined vacation rental portal. HomeAway’s massive inventory is still tied to an aging interface, to say nothing about the aging monetization model. Movement in this sector is apparent, as indicated by headlines and press releases, and a shopping bag full of property rental sites popping up; @Leisure-Group – acquires pureholidayhomes.com Ltd, European Vacation Rentals By Owner, and dozens more indicate investment at least, but only companies like Jetsetter seem to have the slightest idea what they are doing. That closed community for discerning travelers (image below of their interface) being what amounts to a template for “how to” show off rentals (or hotels for that matter). 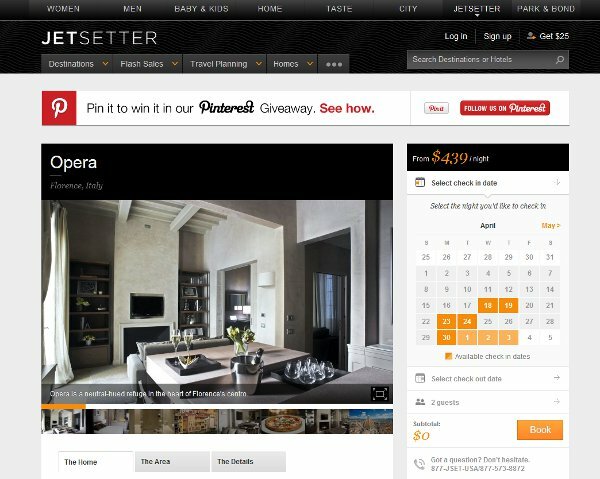 I signed in with Facebook and went to Europe homes in seconds - Jetsetter rocks. For an indication of the need here, looking at most of the sites now offering European vacation properties should reveal a window of opportunity for some. The screen shot below shows clearly the Web 1.0 offerings out there so far. Not exactly the most appealing stay for Cologne, Germany, is it now? 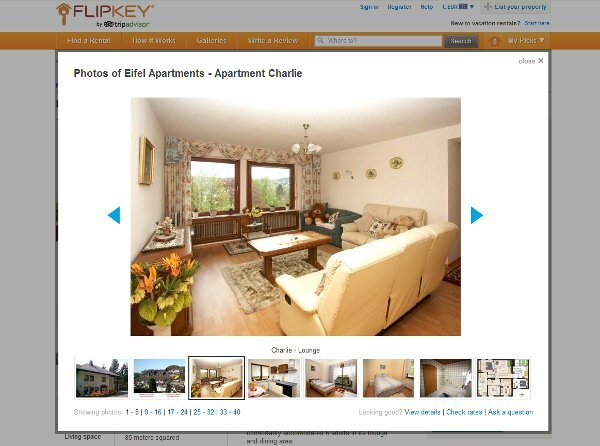 Not to pick on VacationRentals.com alone, the FlipKey offerings (image above) in the same city are not exactly awe inspiring either, even though the site is a bit better laid out. Even the most complete businesses, like the aforementioned HomeAway, have only done a cursory adaptation for the needs of the European rental customer (and client). There are not many exceptions, in fact, I could not find one via search in the top 10. 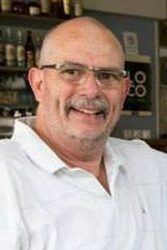 Casamundo, Greatrentals, Rentvillas, Solmarvillas.com, WhiteKeyVillas, Europeanescapes.com, RentaVilla, VillasOfDistinction, eurvilla.com (flash idiocy), the list is endless of clueless and almost valueless web portals out there. Talk about room at the top! We leave you with PhoCusWright’s senior director, research, Douglas Quinby, talking about Europe’s changing vacation rental landscape. 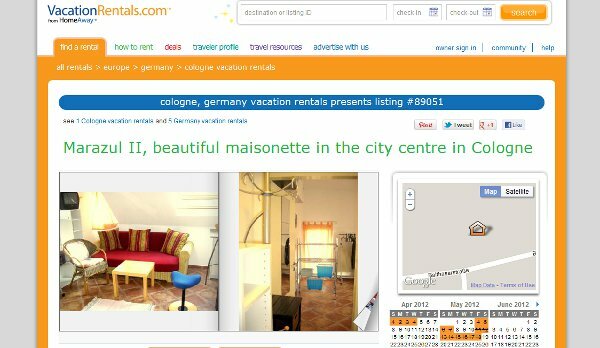 For more information this market, the reader may also want to Google vacation rentals to validate my suggestions here.